Forgetting is a depressing act. I’m on the downside of my 40’s and have noticed lately that I seem to be forgetting more long-term details and memories from my past. But as an instructional designer who knows a thing or two about teaching and learning, I comfort myself. “Forgetting serves a higher purpose,” I remind myself, “It’s evolutionary.” As a species, forgetting makes me adaptable so that I’m always primed for what’s most important. Of course, my memory lapses may simply be age-related. Whether or not aging adults continue to grow new neurons is debatable. The leading belief in the research has been that adults do not form new neurons. A recent study, one touted to be as convincing as can be, has found no traces of new neuron growth in human adults. At the same time, here’s a recent one that says older brains form as many new neurons as younger brains. What was my point? That’s not rhetorical. I’m seriously asking, what was I saying. Ok, I remember now. My memory gaps may be age-related. Neuroscientists would call what I’m experiencing transience, the tendency to forget facts and events over time. This along with a handful of other memory problems are considered to be normal, regardless of age, and not a sign of dementia (huzzah!). As part of the learning process, forgetting is also inevitable. So if you want to learn something well, how do you overcome forgetting? Convince your brain that what you want to learn is important. If it’s novel or surprising, it will stay with you longer. Throughout our existence, that sort of hardwiring has guaranteed our survival. Decay of certain memories promotes good decision making and good decision making keeps us alive. While sometimes more information is better for making a good decision sometimes that information is just noise. It gets in the way of making a good decision. Neuroscientists call this interference. To forget correctly, we must overcome the forgetting curve. 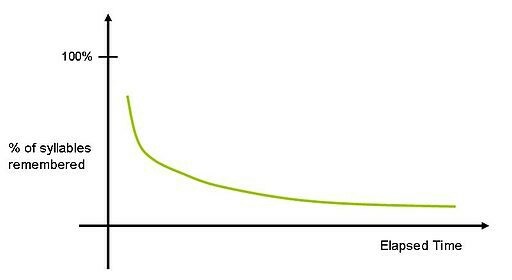 The forgetting curve uses a mathematical formula to demonstrate the rate at which something gets forgotten after its learned. The forgetting curve was created by German psychologist Hermann Ebbinghaus who performed memory tests on himself by seeing how may combinations of nonsense syllables he could remember over a certain period of time. You’ll see a typical forgetting curve below. It’s steep in the beginning and then trails off. Therefore, forgetting is vicious immediately after learning but the few things that do stick with a person, stick with them a long time. Ebbinghaus also found the steep plummet could be softened by repeating what was learned at specific intervals. This has become known as spaced repetition. The repetition part of spaced repetition is probably logical enough to understand as a function of learning. However, repeating the thing many times within a brief time period (e.g., like a student might do the night before the test) doesn’t promote deep learning of that thing. And anything that isn’t learned deeply is more likely to be forgotten over time. The spaced part of the spaced repetition is the key. By repeating the thing a bit, then waiting a few days and repeating it again, then waiting another few days, but not necessarily the same interval as the first wait, aids in strengthening that thing in long-term memory. Why? Because after a few days, we need to work harder to reconstruct that thing. Because it’s not right at the front of our mind, we must go searching for it. Thinking about it. It’s this process of trying to remember the thing that strengthens the connection in our long-term memory for that thing. With all that said, my humble advice to you then is three-fold. First, accept that forgetting is a natural part of being human. Second, make information to be learned as engaging as possible. Third, whether it’s very engaging or not engaging at all, remember that you must use it or you will lose it. That means if you cannot employ the information regularly into your daily life you need to engage in a technique like spaced repetition to help create cognitive durability for that information.